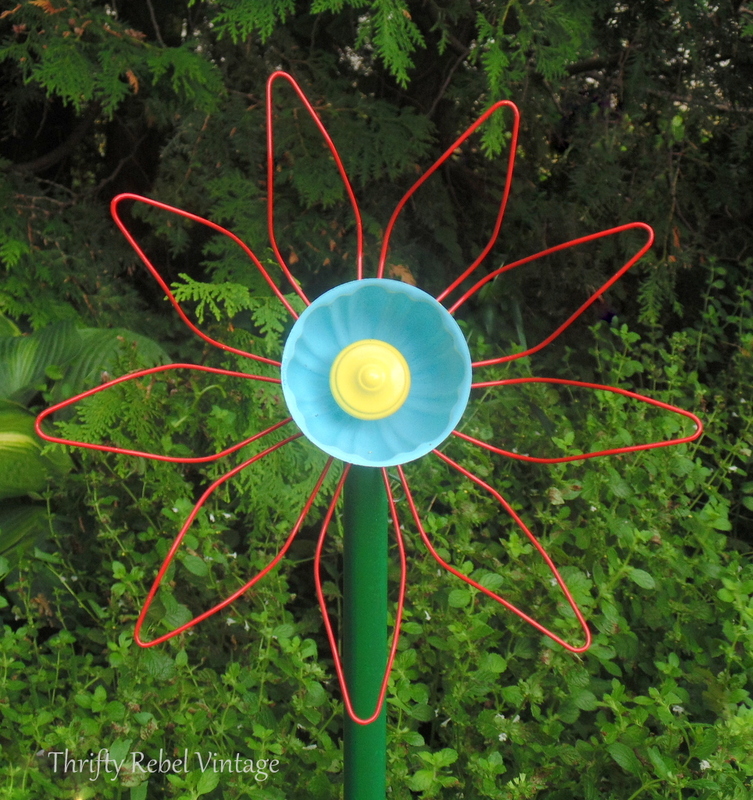 One of the things that makes repurposing so much fun is that you never know where your next project is coming from… what will inspire it, or where you’ll find it. It could be something that strikes your fancy at a thrift store or a garage sale, or maybe you stumble across something totally by accident when you’re looking for something completely unrelated. It’s just kismet… a meant to be kind of thing. Well that’s what happened to me when John and I were at our local Home Hardware recently. I don’t even remember what we were looking for, or if we even found it… because once I saw these leaf straining beauties I was so excited that quite frankly whatever we were supposed to be looking for went right out of my head. In my world inspiration trumps practicality every time. lol. 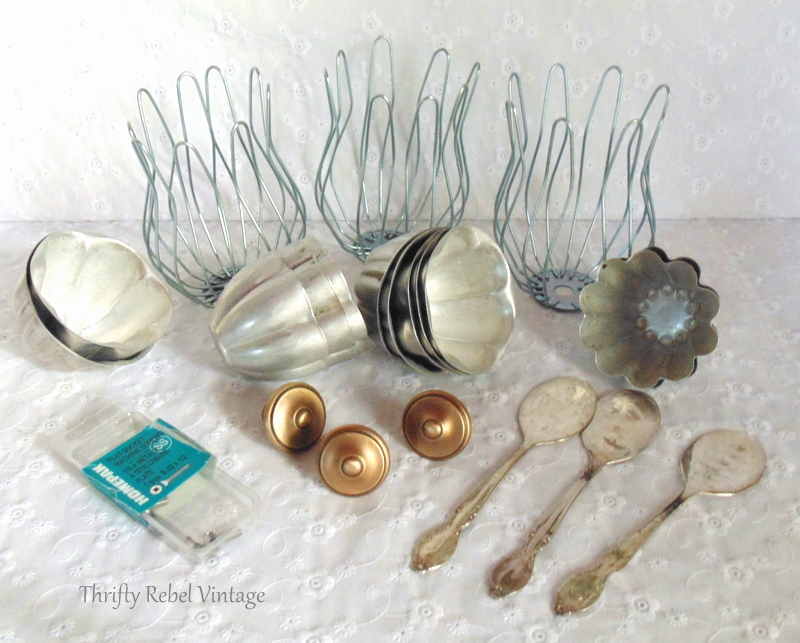 So there are my three beauties in the back, just waiting to be made into flowers for my garden… along with some vintage jello molds, three drawer knobs, some half inch flat end screws, and three silver plate teaspoons. 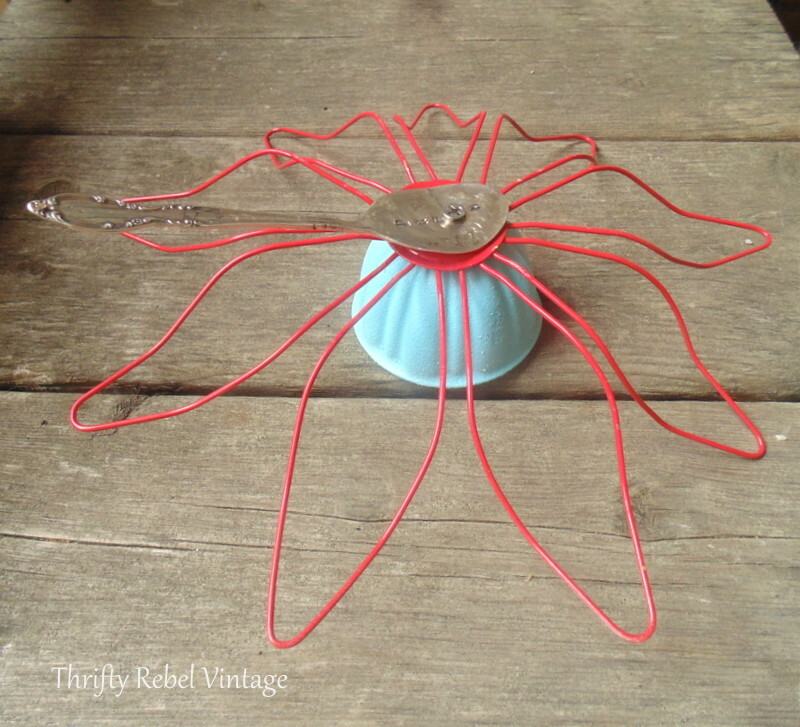 I save stamped silver plate spoons that I made booboos on for times just like this. Stainless steel teaspoons are way too hard to drill through. 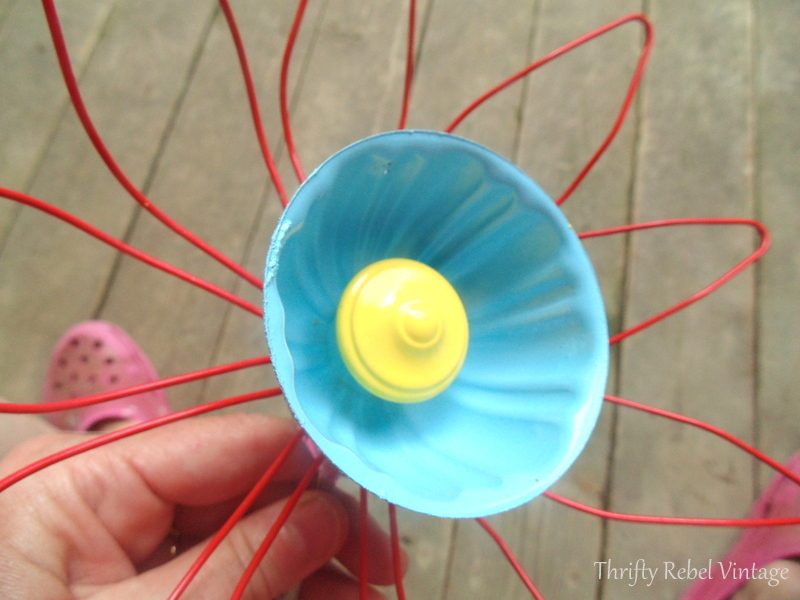 The gutter leaf strainers cost $3 each, which is a little pricey for me… but not pricey enough to deter me because I just had to make these flowers. 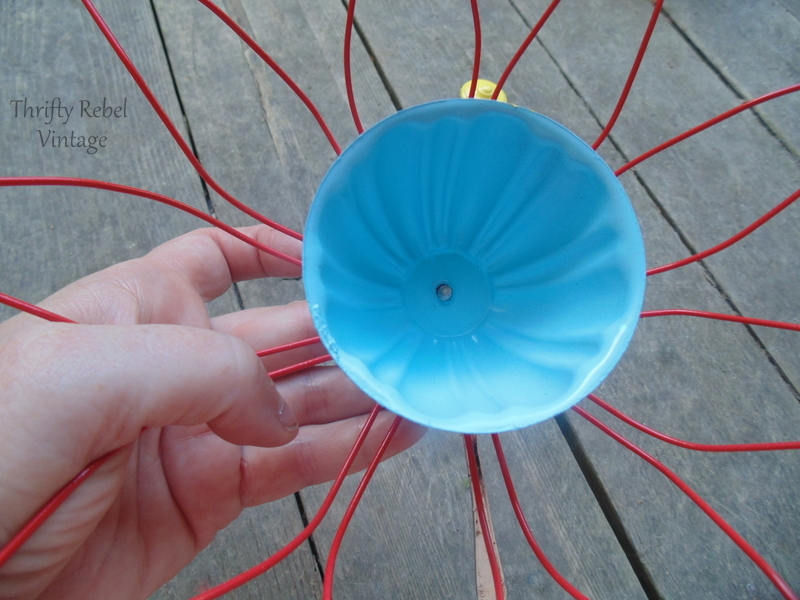 NOTE: If you’ve never heard of gutter leaf strainers… join the club. lol. Apparently they go open side down into eavestrough/gutter downspouts and they’re supposed to stop leaves/twigs etc from going down. I did some googling and there are many different styles in all shapes and sizes. Here we call them gutter leaf strainers, but they might also be called downspout protectors, gutter leaf filters… and who knows what else. If you look in the eavestrough/gutter area of your hardware/building supplies store that’s where they should be. If you can’t find this exact style you might be able to modify whatever style you find. 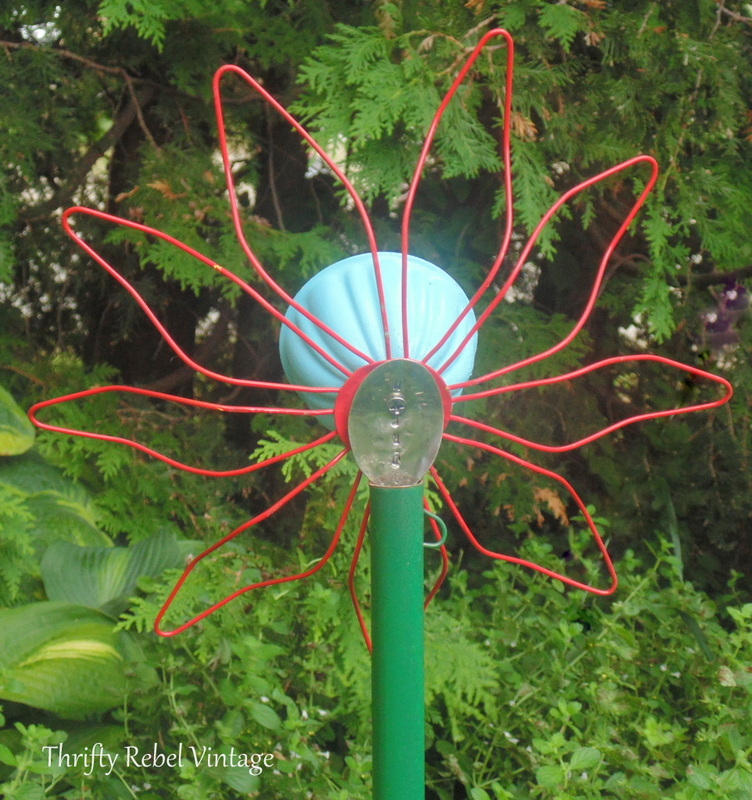 With this particular leaf strainer style creating the main part of the flower is so easy. All you need to do is bend back the sections, sort of like peeling a banana. When you’re finished it should look something like this. Then it’s time to start manipulating the sections so they look more like petals. 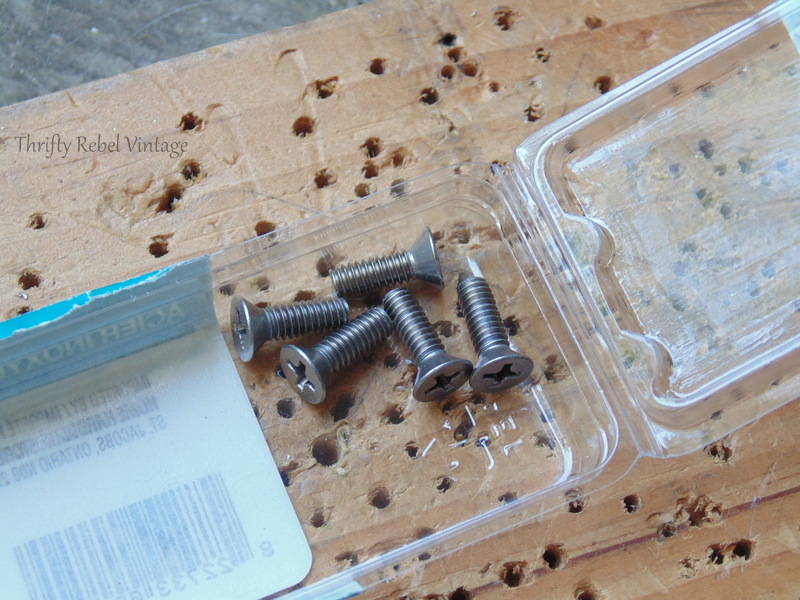 Here are the 8/32 half inch screws that will hold my repurposed gutter leaf strainer flowers together. 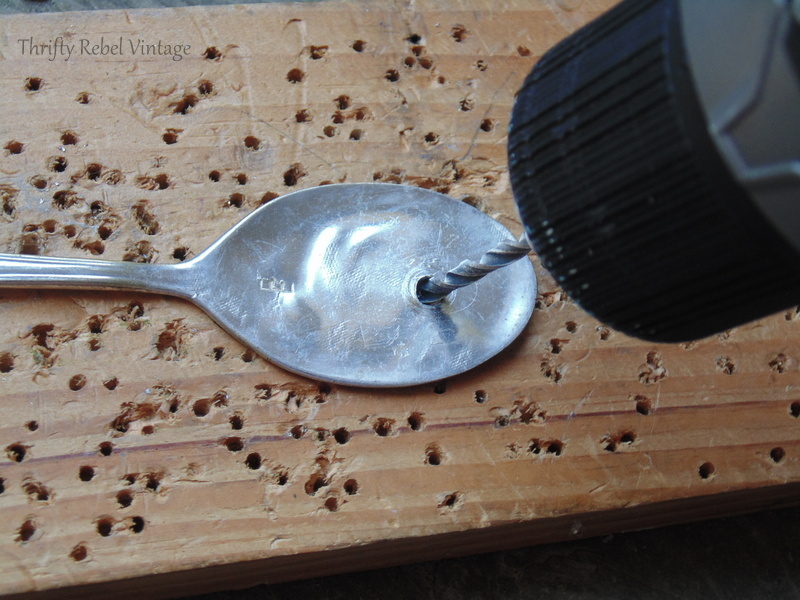 But first I need to drill a hole into the spoon. 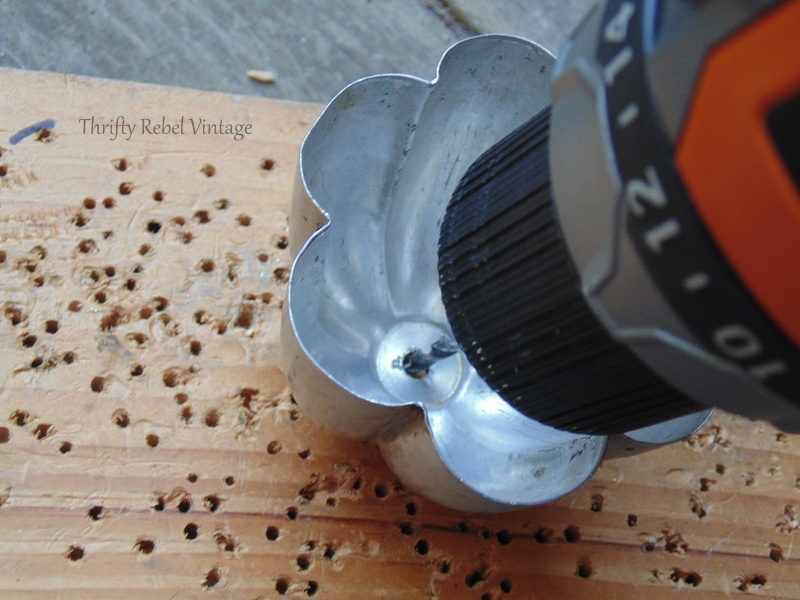 I started will a smaller bit, a 3/32″ (sorry didn’t get a pic of that), and then I used a 8/32″ bit to make a hole big enough for the screw to get through. Make sure to use bits specifically for metal, and always always wear protective eyeware. The jello mold metal is so soft that I was able to get through very easily with the bigger bit. 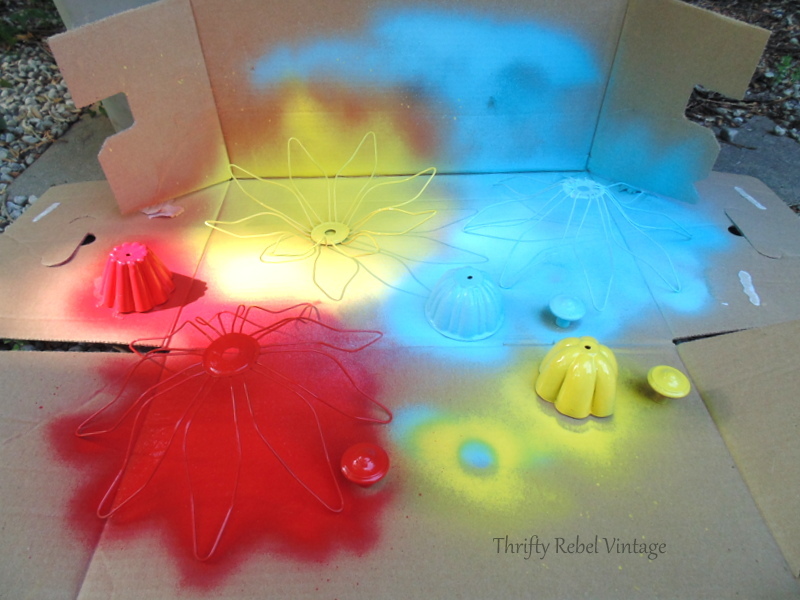 Then I took everything outside to spray paint some fun colors… backs and front, insides and outsides. 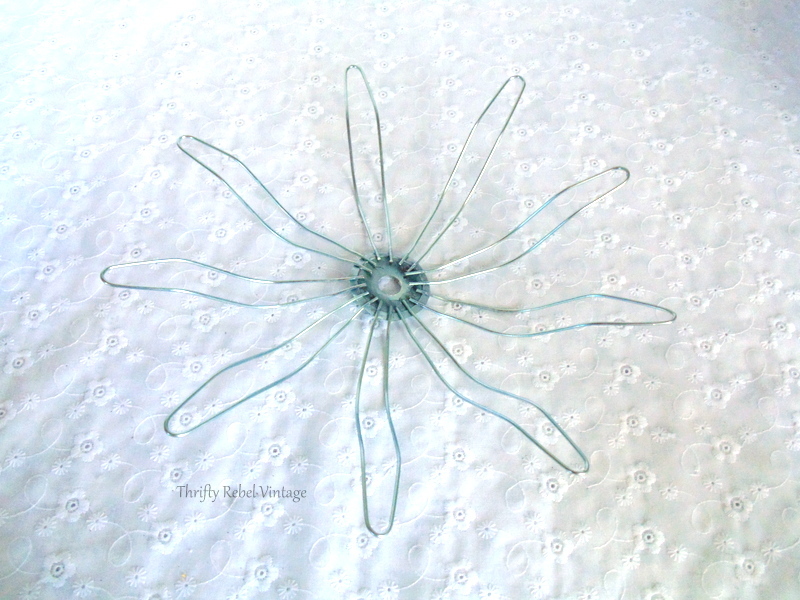 When putting the flowers together the first thing to do is thread the screw through the spoon. 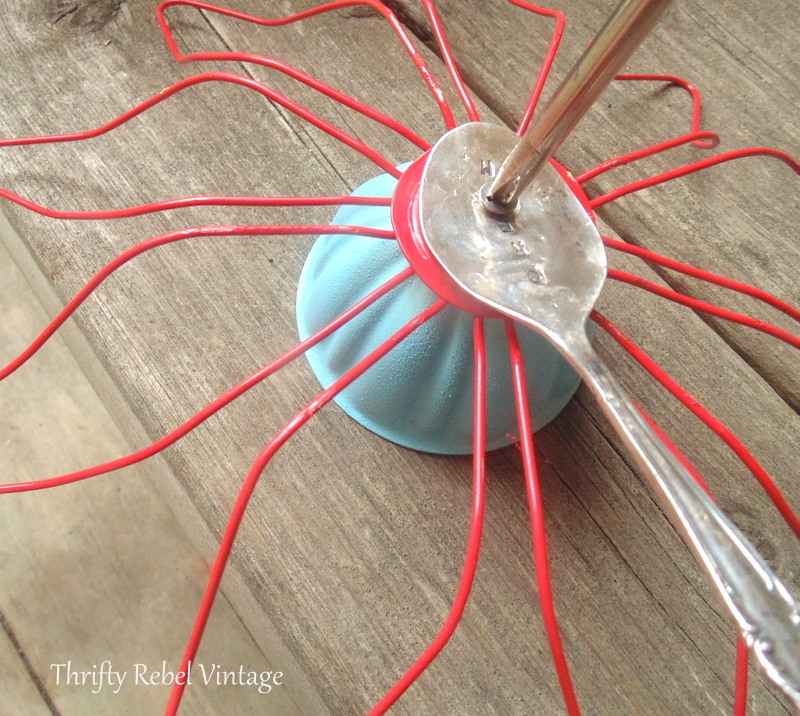 Then place the spoon at the back of the leaf strainer and push it through the jello mold hole. Then you simply screw the drawer knob onto it. Use a screwdriver to tighten it up. At this point you can bend the spoon just a bit so the flower will sit nicely. 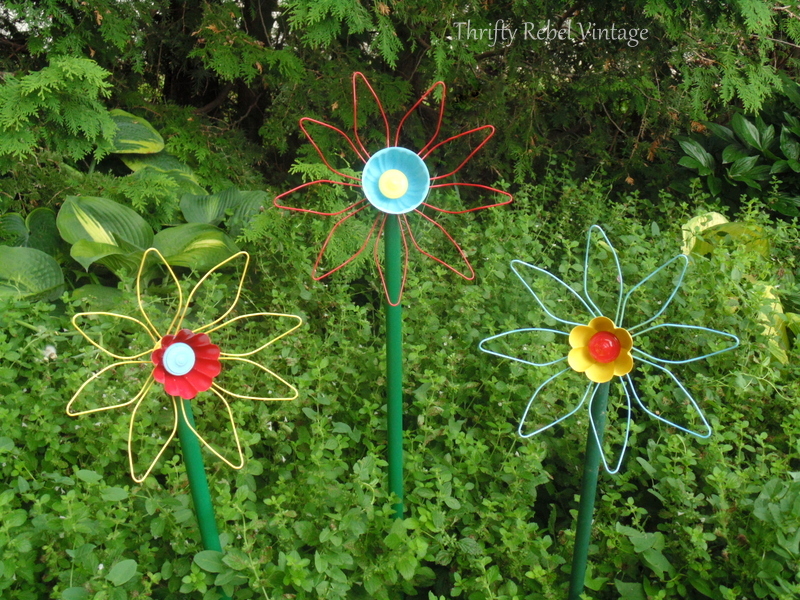 And here are my finished repurposed gutter leaf strainer flowers. 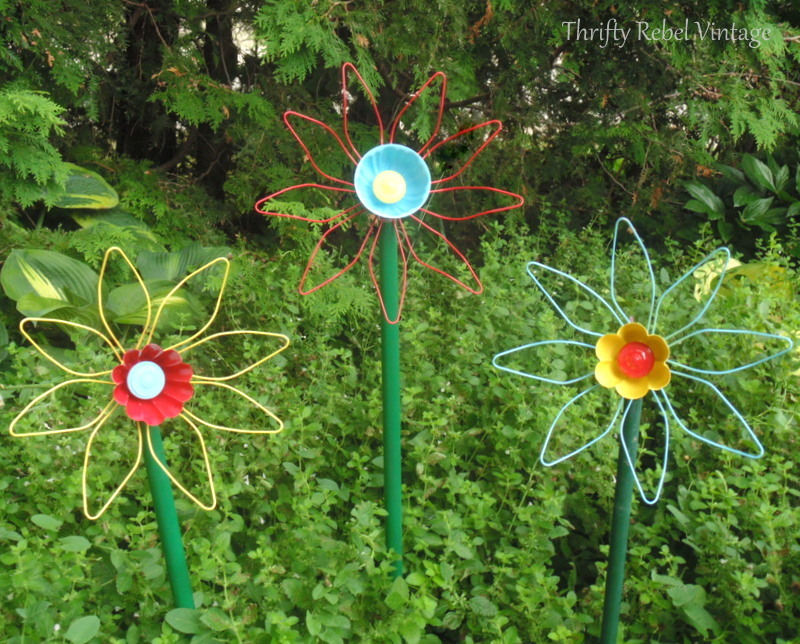 I moved my dollar store clothespin flowers to another location in the garden so I could use these pipes that are in front of the kitchen porch. I used a different jello mold for each one, and I combined the three colors differently for each flower. This way each one is unique, but they also relate well to each other. Here you can see what my flower looks like from the back. And here are some close up front views. I love that these are held together by just one screw, and I can take them apart at any time and change them up if I want to. 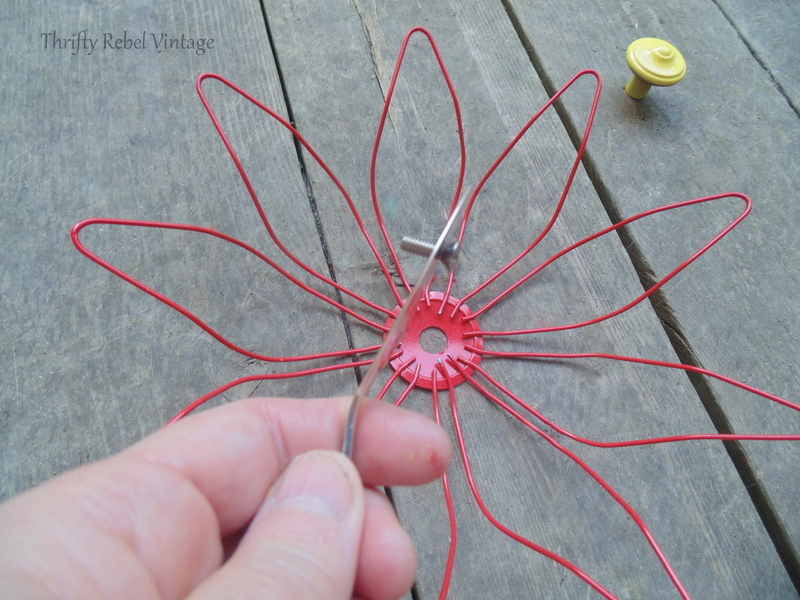 You could certainly glue these flowers together if you don’t want to use a drill, by using either E6000 or Marine Goop Adhesive glue. These flowers were pretty easy to put together, and I have to say that I love turning purely practical things into something pretty. 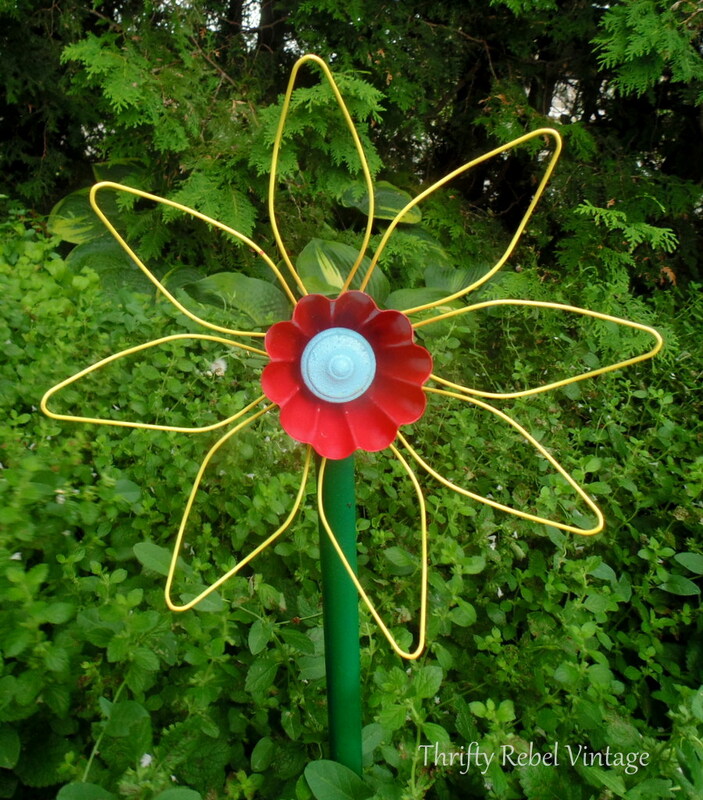 So the next time you’re in a hardware store, keep your eyes open and you just might stumble upon your next repurposing idea. 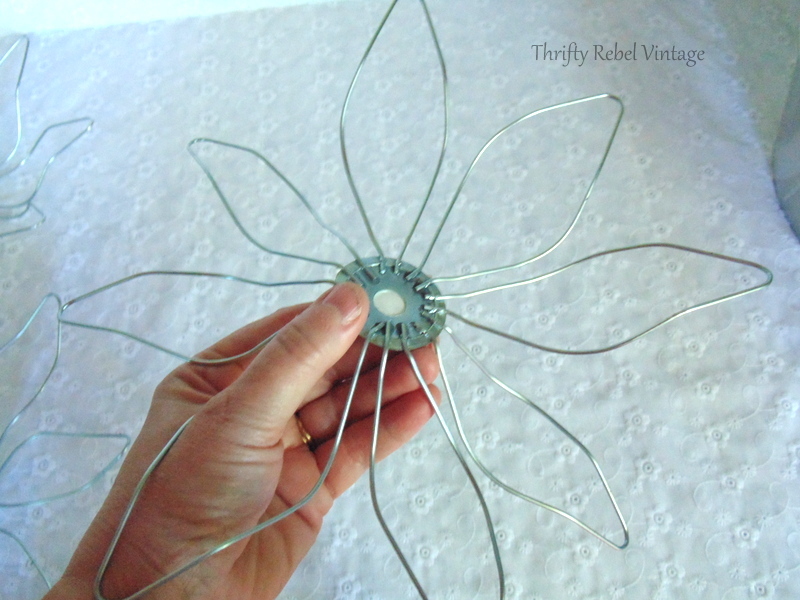 I’m working on another project with more of these leaf strainers right now, and hope to share it soon. 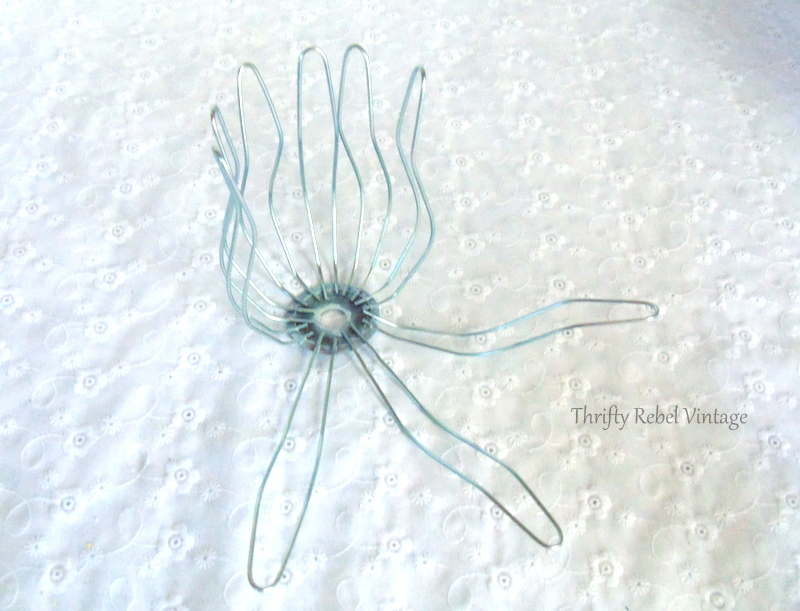 If you enjoyed this project you might also enjoy my repurposed diy tulips. Too cute, Tuula! 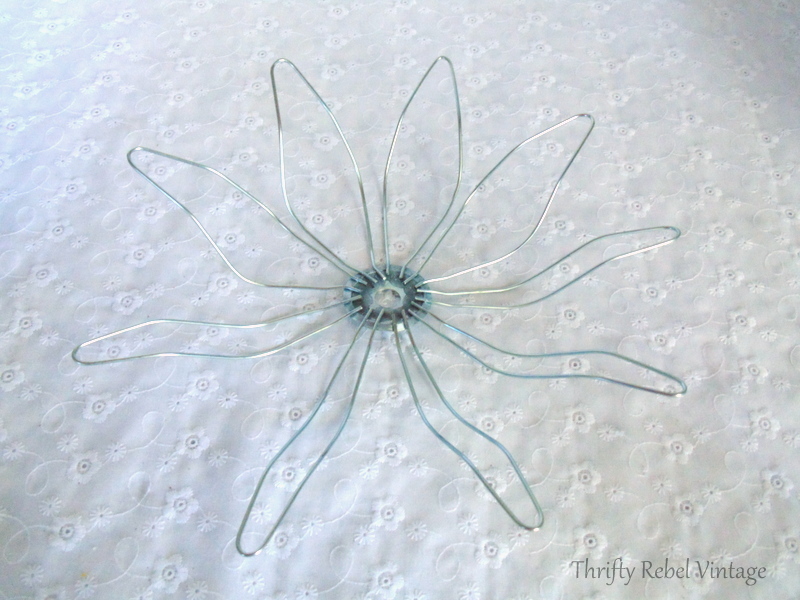 I can see how you decided to make flowers out of the leaf strainers! I probably would have, too – because I see tulips just waiting to be styled and painted! Thank you so much Ardith! They kind of remind me of pinwheels. Would be nice if they could spin. I love what you made. You are so creative. Well, you have done it again Tuula! Those are just adorable, I love them! Pinning! Those are absolutely adorable Tuula! I love them & I haven’t heard of them either, but I’ll start looking out for them. I can see why you got so excited! Thanks Florence! It’s really fun to discover cool things that I’ve never heard of, especially when I can immediately see what they could be. These are so awesome, Tuula! Love them;) I get distracted at all the potential in hardware stores, too! Those are really cute! You are amazing.. and have the most creative ideas! Thanks Marie! I’m so glad I could help. 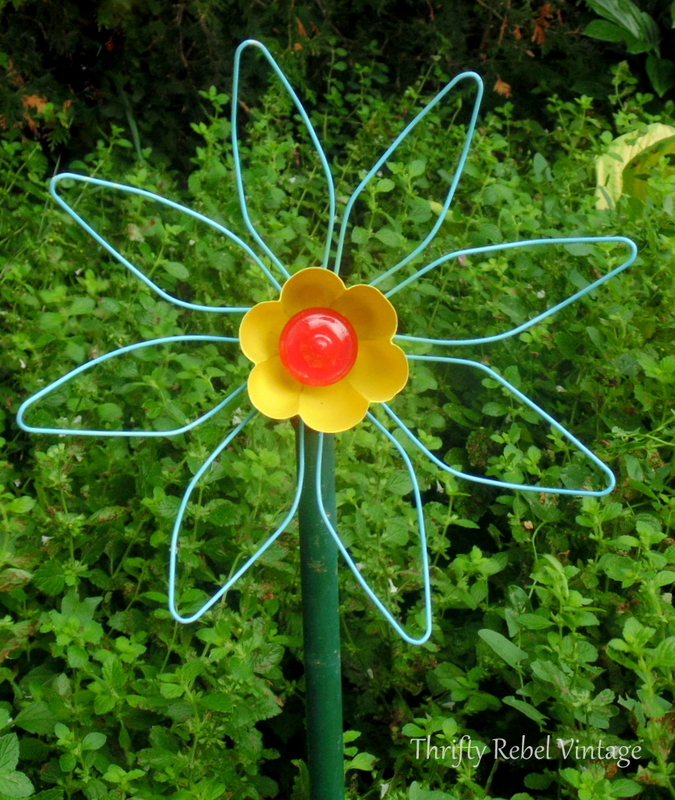 My garden can’t have enough whimsical flowers. No watering required is always a good thing, especially with this hot and pretty dry summer we’re having so far. These are adorable! 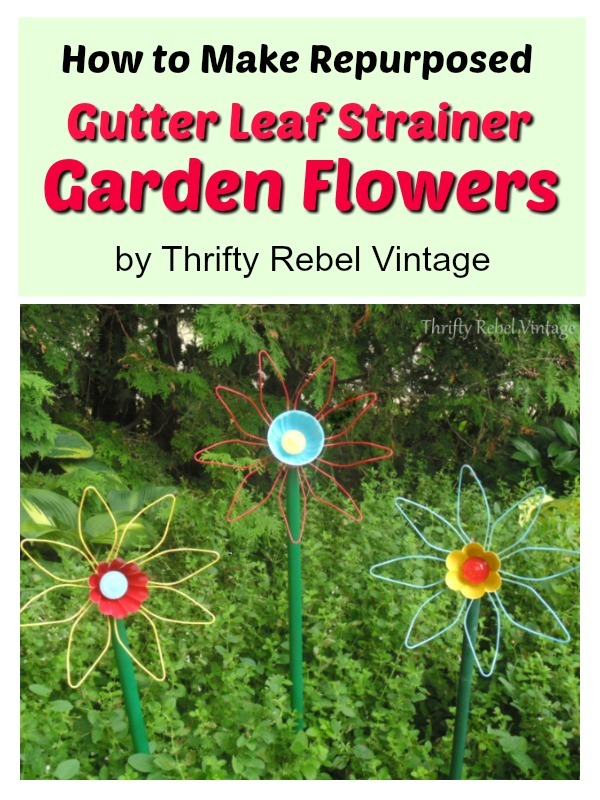 I have never heard of gutter leaf strainers and I love your imagination in making them such a cute garden décor item. Thanks AnnMarie! Just like thrift stores I never know what I’ll discover at the hardware store. I have been spending time when I can’t sleep looking at all the possibilities for all of my junk treasures? I love to do that too Pam. I often find inspiration in my junk stashes. So cool, a great idea!! !